Hi friends! The sun is out spreading cheer today, & I thought I'd do the same by sharing with you this fun & bright butterfly card that is so simple to make! This card was made using the colour blocking technique. This basically means you choose a few fun colours to work with, you then cut and measure your cardstock to size & adhere the pieces side by side. It's so simple yet it adds some fun interest to your project. 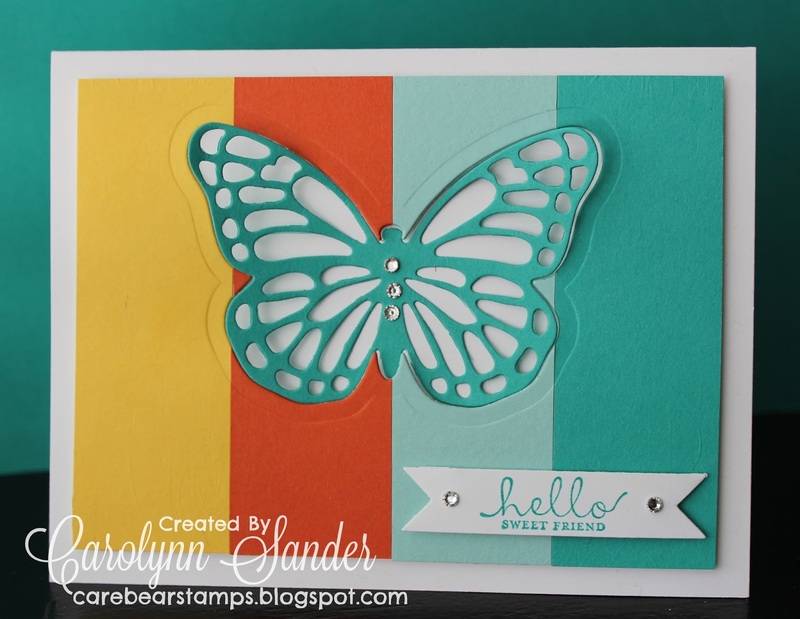 I then used the Butterfly Thinlit Dies by Stampin' Up! with my Big Shot Machine to create the main image here. I like the clean simplicity of this card. Spring is not too far away right? Thanks for stopping by & feel free to email me at carebearstamps@gmail.com if you are interested in learning more about Stampin' Up!, hosting a party, or placing an order. P.S. Check out the Stampin' Up! supplies used to create this project in the list below!